Told in first person point of view, The Strange Fascinations of Noah Hypnotik is a coming-of-age story that explores the strange and fascinating life of Noah Oakman. Noah is tired of figuratively wearing the same old sweater. After being hypnotized, Noah starts noticing all these crazy physical and personality changes with his family, friends, and even his dog. As Noah explores these odd occurrences, he also starts contemplating the definition of being alone versus alienation. Throughout the novel, Noah delves into his life choices while backpacking his favorite authors, books, musicians like David Bowie, and iconic songs along for the ride. Check out my 5-star RAVING review HERE. Music and notable musicians play important roles in The Strange Fascinations of Noah Hypnotik, and throughout Noah’s mind-boggling life he highlights the most fantastic tunes. But what fascinated me the most is that Noah’s world is surrounded by great people who inspire the perfect playlist. Below, check out some of my favorite quotes which sparked an eclectic playlist of songs. Note: Thank you to Penguin Teen for having me on this blog tour and for providing me a review copy to read for free in exchange for an honest review. All statements and opinions are my own. Please note that I do not own or have rights to any of the music, lyrics, quotes, or videos shown in this blog post. All quote images were created by me. First off . . . WHOA! There is no one way to explain the profound literary oddities and beautiful complexities of The Strange Fascinations of Noah Hypnotik. But for me, this book was a combination of my favorite movie, one of my favorite books, and one of my favorite TV shows. Mix the quirks and cerebral explorations found in Eternal Sunshine of the Spotless Mind, add in a dash of Holden Caulfield’s blunt honesty and independent drive and the uncensored monologues of Angela Chase in My So-Called Life, and you get the perfect tome called The Strange Fascinations of Noah Hypnotik. The Strange Fascinations of Noah Hypnotik is a modern-day coming-of-age story that highlights and explores the emotional aspects of being alone versus loneliness. Told in first person point-of-view, Noah (the main character) explains to the reader that he is tired of figuratively wearing the same old sweater. He is tired of everyone expecting a traditional path for his future, when he honestly doesn’t even know what he wants. So after drinking the fruitiest of alcoholic beverages and ranting to a random stranger, Noah is hypnotized and wakes up noticing all these crazy physical and personality changes with his family, friends, and even his dog. The only constant in his life is his hilarious and good-hearted sister, Penny. For months, Noah unravels his own thoughts and exerts himself into the lives of lonely strangers. And in the end, Noah wakes up to a world of panic, concerns, heartache, but more importantly, love, compassion, and a triangular friendship. David Arnold is one of my favorite young adult writers because his novels always encompass so much passion; his characters are so authentic and his storytelling always provides a realistic truth and the raw grittiness of teenage life. 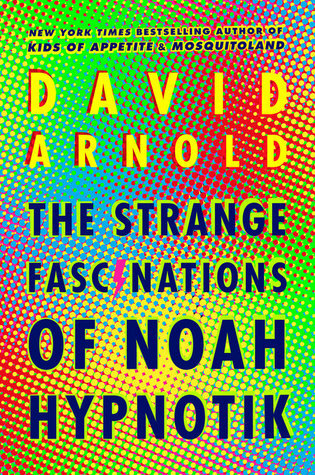 So when it comes to The Strange Fascinations of Noah Hypnotik, once again, David wrote a book that took my love for his work to the next level. This contemporary book, with a sprinkle of science fiction, made me laugh so hard but also tear up in other scenes. The Strange Fascinations of Noah Hypnotik made me want to listen to Bowie non-stop and watch my favorite episodes of Gilmore Girls. And oddly enough, this novel made me think about how much I love my younger brother and how I appreciate that he is that stable constant in my life. If you love humming to the theme song of Friends and following a eccentric character that takes you on an unbeaten path, pull up a chair and open the pages to Noah’s strange and fascinating life known as The Strange Fascinations of Noah Hypnotik. Note: Thank you to Penguin Teen for providing me a review copy to read for free in exchange for an honest review. All statements and opinions are my own.